What pops up in your mind when you hear the name “tornado”? For most people, it is a picture of a magnanimous funnel shaped dark cloud extending up to the sky. Its body is made of powerful wind spinning in a circular motion about the center. You will be surprised that such a dangerously beautiful natural phenomenon can be recreated by you, in a miniature form, at home using very simple means. Given below is a process which will equip you with the steps to create a water tornado in a bottle. Fill one of the bottles two-thirds with water. Add three drops of dish washing liquid and couple of drops of food color to the water to make the vortex prominent. Use duct tape to fix the mouths of the two bottles together after placing the metal washer in between them. 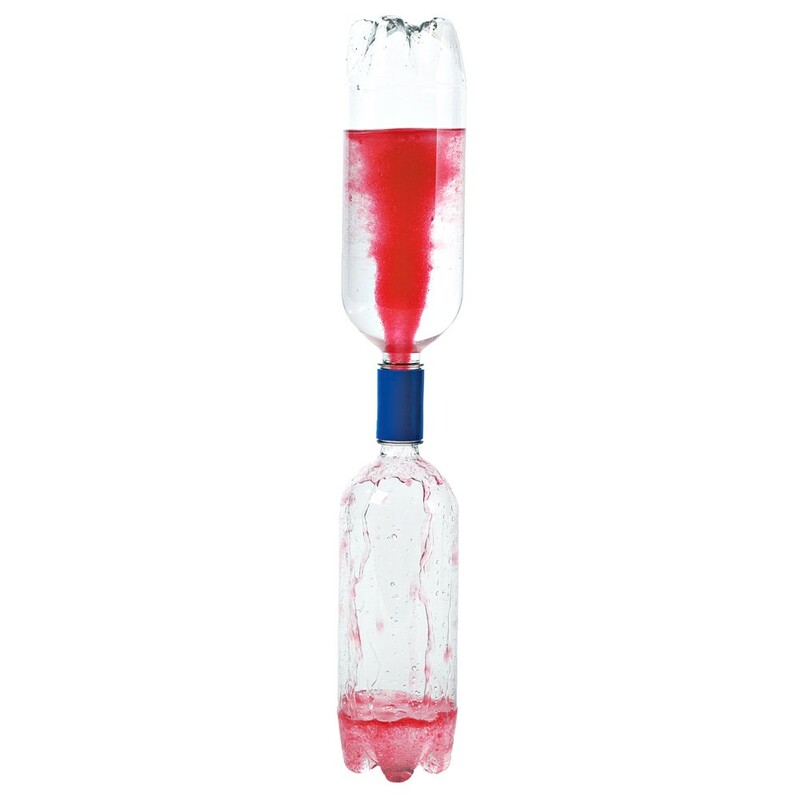 You can also use a cyclone tube or tornado tube to connect the two bottles. Now keep the system upright by inverting the filled bottle over the empty one. You will observe a slow movement of water from the top to the bottom chamber and a simultaneous bubbling of air from down up. After some time, the flow of water may completely come to a halt. Now swirl around the setup rapidly in a horizontal circular motion. Do not shake it vertically up and down. You are free to rotate clockwise or anti-clockwise but not on a combination of both. You will find a vortex forming in the upper bottle while the water gushes into the lower one. 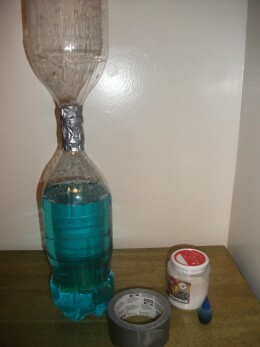 The experiment can also be done using a jar or a single bottle. However, it is not recommended as the water drains out very quickly and you need to fill up the bottle again for a prolonged observation. On the other hand, the two bottle model uses convenient recycling. If the water in the top bottle gets exhausted, turn the lower one over the upper and continue the fun. When the first bottle is inverted over the second, due to surface tension, a thin elastic skin-like layer of water at the center of the washer gives some resistance to the downward flow of water. But as the pressure of water in the first bottle is much higher, the liquid drips down by creating a small hole in the aforesaid skin. As more and more water flows down, the water pressure above decreases whereas that of the air below increases. Hence, air in the form of bubbles escapes into the upper chamber. At equilibrium, the pressures above and below the washer just balance each other, stopping any further movement of water or air. However, if the entire setup is kept rotating, then a centripetal force comes into play that makes the water swirl around in circles while descending. This circular funnel-like movement creates a small aperture in the center of the flow which is devoid of any liquid. 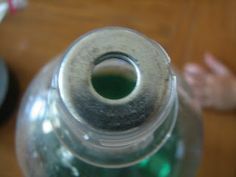 This hole facilitates the flow of air from the lower bottle, upwards. Thus, both the water and air continue their complementary motions smoothly without any hindrance to each other resulting in an increased rate of flow. 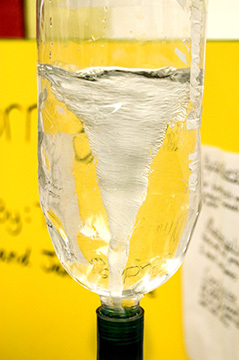 This sums up the explanation to the tornado in a bottle Science experiment. You must already be keen to try this homemade tornado in a bottle project, now that you know the nitty gritties. It can be a wonderful idea for your next Science fair project. Write a proper hypothesis for the formation of a tornado in the top bottle as water gushes down and take ample notes during the process. Just be extra careful to make the apparatus water-tight. You surely wouldn’t want to get yourself drenched in your own tornado!